It’s time once again for our Designer Challenge. This time I presented three gorgeous chair options and asked each designer to select her favorite and tell us what she’d do with it. First up, I’m thrilled to introduce Shandra of Signature Style. Not only is Shandra the principal designer of her own firm, she also knows a thing or two about set design, art, entertaining and a whole lot more. This multi-faceted gal shares a wide range of topics on her blog, including party dessert tables, decorating for the senses and “ask the designer” segments. Greetings Satori Readers! 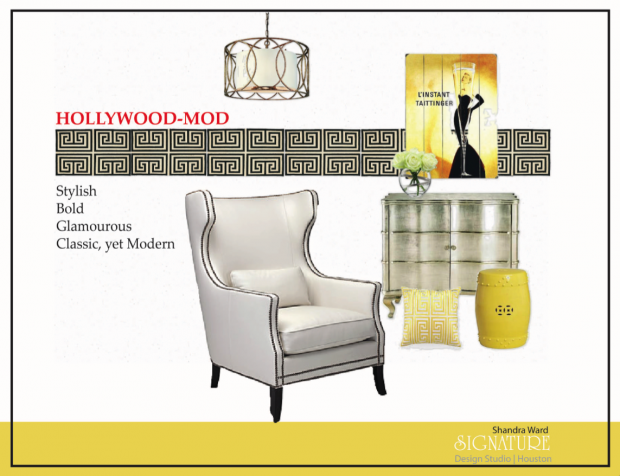 My name is Shandra Ward, owner and interior designer at Signature Design Studio in Houston, Texas. I am also a freelance writer and the creator of Signature Style Design and Lifestyle Blog. I’m very excited about being a part of Shauna’s Designer Challenge. I was presented with three beautiful chair options. First up was the Kidman Bergere Chair from The Cross. 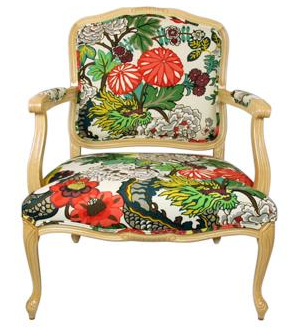 The second option was ZGallerie’s Eddie Accent Chair. 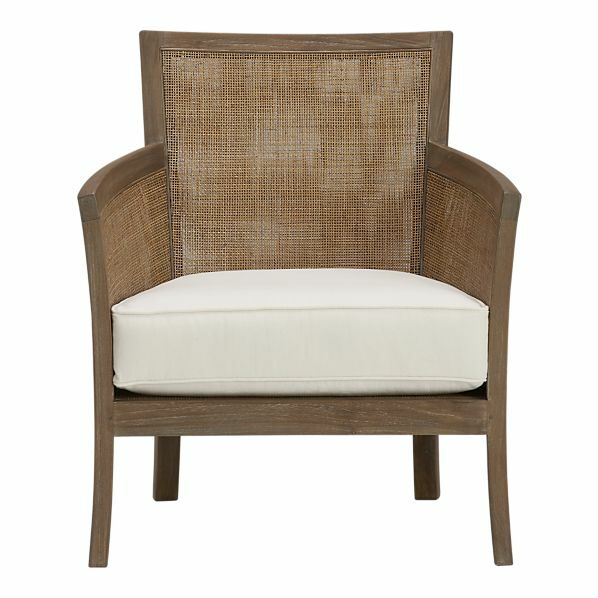 And the last possibility was the Blake Grey Wash Lounge Chair from Crate and Barrel. 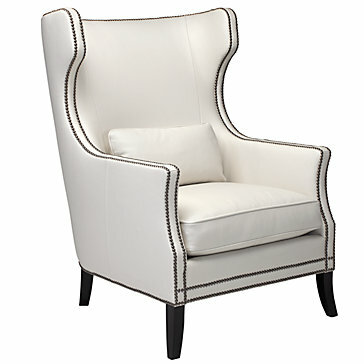 For this chair challenge, I chose the White Eddie Accent Chair from ZGallerie because I love all types of furniture that have brass nailheads. This particular piece of furniture has classic style, plus the white leather gives it a little modern flair. I chose this fabulous chair because I thought it would make a great reading chair or a nice place to sit and chat with a friend. For lighting, I chose a Sausalito Drum pendant light from Lumens that features a linen shade, hand-worked wrought iron body and silver gold finish. This lighting feature adds the right amount of sparkle. The gorgeous sideboard from The Well-Appointed House displays classic lines in a silver-pearl finish. This unique cabinet is not only glamorous, but it offers extra storage space for your essentials. Being an art consultant and collector, I chose a stylish art piece from Home Decorators Collection to bring bold color into the grouping. The Greek fret work serves as great idea for a wall treatment without over powering the space. The yellow garden stool, from The Well-Appointed House, is the perfect table to park your coffee or mint julep while reading your favorite novel. And lastly, a silk patterned pillow that mimics the wall border. It adds softness and comfort. Thanks Shauna for inviting me to participate in the Satori Design for Living Designer Challenge. Thanks Shandra. Your collection is elegant and oh-so glamorous! It’s the perfect design for the sophisticated gal. Now it’s your turn- would you select the Eddie Chair as well or one of the other options? What kind of space would you design around it? If you’re a design blogger and you’d like to be part of an upcoming Designer Challenge, please shoot me an email or leave a comment below. I love Shandra’s Holleywood-Mod board! Brass nailhead trim and that drum shade – LOVE! I’m digging nailheads too! I’d love that chair for my bedroom and the light fixture could make its way in there as well. Thanks for stopping by! I’d read all day in that chair! Have seen it at Z gallerie and have been dying to use it for a client. Love it and anything with nailheads as well…I’d love to be a part of the next design challenge so please keep me in mind. I will definitely keep you in mind. Thanks for stopping by!